The state of Arizona requires NCCAOM certification, which can be obtained by taking NCCAOM CEU or PDA Courses. According to section 32-3925(c) – A licensee shall include with the application for renewal documentation satisfactory to the board that the licensee has successfully completed at least 15 hours of board approved continuing education each year. The process of getting Arizona continuing education credits is simple, convenient, and easy: Download the course, finish the online quiz, and receive a certificate of completion immediately online. You can finish all your continuing education requirements on you desktop, mobile phone, or I-Pad. Reading material are printable. Courses are either in Written format or in a Live webinar. 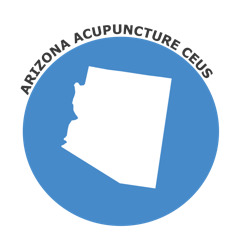 Visit our Acupuncture CEUs page to find out about any other state requirements.